Peter Jonker is more than your average, every day human. He has magical gifts that set him apart from the rest of the world, ones that he struggles to maintain. We are first introduced to Peter as a young child, being told stories of Wodan, the God of Germanic and Scandinavian Berserkers. As Peter grows older, he finds out he has immortal powers, and of course he is found out, to be used for his set of skills. The very God he learned of as a small impressionable child,Wodan, is now after him to join his army the Berserkers. The lines of Reality are blurred, and Peter struggles with the truth of what happened to his people. Peter eventually decides to take an unconventional approach to find out the truth by being hypnotized. Unaware of the changes that are to occur in his life, Peter presses forward. The rest of the story will take you on a roller coaster ride of good vs. evil, forcing the reader to question how they would handle the same situation. I found the historical undertones of the book to be a refreshing adage to the story. 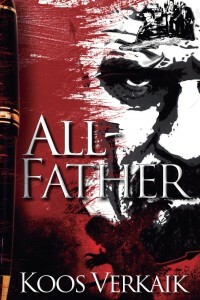 All-Father was a quick, yet interesting read, and I found it hard to put it down. All of the details easily kept my attention, and I cannot wait for more of Mr. Verkaik's books to be translated! I could easily see some of his work next to greats such as Stephen King, or Dean Koontz. Keep up the amazing work! I'll definitely be following this up-and-coming author. READER AND WRITER EVENT MUST ATTEND!!! I loved this book. I actually read it when I was in highschool and thoroughly enjoyed it.